September 15, 2016 – Supermassive black holes, with their immense gravitational pull, are notoriously good at clearing out their immediate surroundings by eating nearby objects. When a star passes within a certain distance of a black hole, the stellar material gets stretched and compressed — or “spaghettified” — as the black hole swallows it. 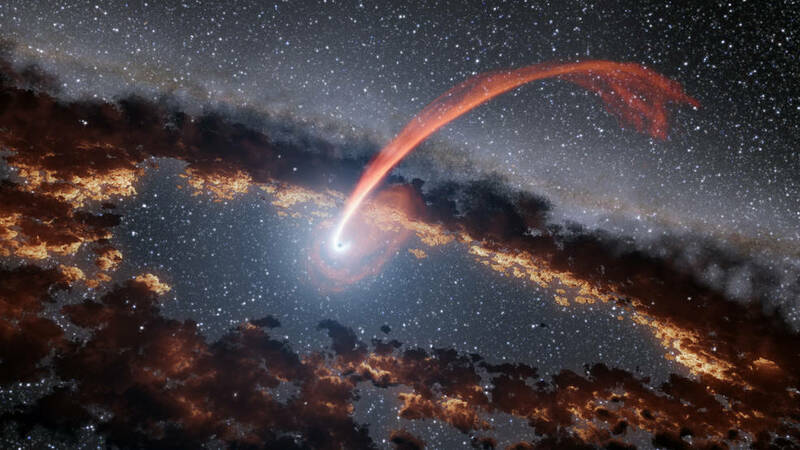 A black hole destroying a star, an event astronomers call “stellar tidal disruption,” releases an enormous amount of energy, brightening the surroundings in an event called a flare. In recent years, a few dozen such flares have been discovered, but they are not well understood. Astronomers now have new insights into tidal disruption flares, thanks to data from NASA’s Wide-field Infrared Survey Explorer (WISE), built by Ball Aerospace & Technologies Corp. in Boulder, Colorado. Two new studies characterize tidal disruption flares by studying how surrounding dust absorbs and re-emits their light, like echoes. This approach allowed scientists to measure the energy of flares from stellar tidal disruption events more precisely than ever before. “This is the first time we have clearly seen the infrared light echoes from multiple tidal disruption events,” said Sjoert van Velzen, postdoctoral fellow at Johns Hopkins University, Baltimore, and lead author of a study finding three such events, to be published in the Astrophysical Journal. A fourth potential light echo based on WISE data has been reported by an independent study led by Ning Jiang, a postdoctoral researcher at the University of Science and Technology of China. Flares from black holes eating stars contain high-energy radiation, including ultraviolet and X-ray light. Such flares destroy any dust that hangs out around a black hole. But at a certain distance from a black hole, dust can survive because the flare’s radiation that reaches it is not as intense. Astronomers used a technique called “photo-reverberation” or “light echoes” to characterize the dust. This method relies on measuring the delay between the original optical light flare and the subsequent infrared light variation, when the flare reaches the dust surrounding the black hole. This time delay is then used to determine the distance between the black hole and the dust. Van Velzen’s study looked at five possible tidal disruption events, and saw the light echo effect in three of them. Jiang’s group saw it in an additional event called ASASSN-14li. “Our study confirms that the dust is there, and that we can use it to determine how much energy was generated in the destruction of the star,” said Varoujan Gorjian, an astronomer at NASA’s Jet Propulsion Laboratory, Pasadena, California, and co-author of the paper led by van Valzen. NASA’s Jet Propulsion Laboratory in Pasadena, California, manages and operates the WISE/NEOWISE mission for NASA’s Science Mission Directorate in Washington. The Space Dynamics Laboratory in Logan, Utah, built the science instrument. Science operations and data processing take place at the Infrared Processing and Analysis Center at the California Institute of Technology in Pasadena. Caltech manages JPL for NASA. Ball Aerospace & Technologies Corp. of Boulder, Colorado, built the spacecraft.